This is a list of airports in California (a U.S. state), grouped by type and sorted by location. It contains all public-use and military airports in the state. Some private-use and former airports may be included where notable, such as airports that were previously public-use, those with commercial enplanements recorded by the FAA or airports assigned an IATA airport code. City served – The city generally associated with the airport, as per the airport's master record with the Federal Aviation Administration. This is not always the actual location since some airports are located in smaller towns outside of the city they serve. It is not meant to be a complete list of cities served, which can be found in or added to each airport's Wikipedia article. FAA – The location identifier assigned by the Federal Aviation Administration (FAA). These are linked to each airport's page at the AirportIQ 5010 website (FAA contractor for the Master Record/Form 5010 database). IATA – The airport code assigned by the International Air Transport Association (IATA). Those that do not match the FAA code are shown in bold. ICAO – The location indicator assigned by the International Civil Aviation Organization (ICAO). Airport name – The official airport name. Those shown in bold indicate the airport has scheduled passenger service on commercial airlines. L: Large hub that accounts for at least 1% of total U.S. passenger enplanements. M: Medium hub that accounts for between 0.25% and 1% of total U.S. passenger enplanements. S: Small hub that accounts for between 0.05% and 0.25% of total U.S. passenger enplanements. N: Nonhub that accounts for less than 0.05% of total U.S. passenger enplanements, but more than 10,000 annual enplanements. CS: Commercial service – nonprimary are publicly owned airports that receive scheduled passenger service and have at least 2,500 passenger boardings each year. 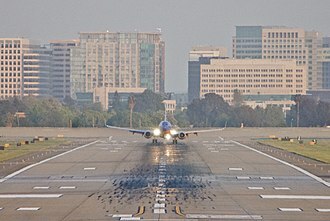 R: Reliever airports are designated by the FAA to relieve congestion at a large commercial service airport and to provide more general aviation access to the overall community. GA: General aviation airports are the largest single group of airports in the U.S. airport system. Enpl. – The number of enplanements (commercial passenger boardings) that occurred at the airport in calendar year 2016, as per FAA records released October 2017. ^ Mammoth Yosemite Airport is listed as a general aviation airport in the NPIAS (2011–2015), but is a commercial service – primary airport based on 2013 enplanements. 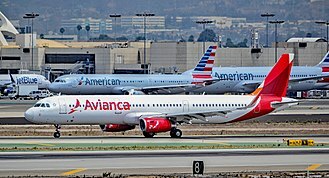 By 2015, the Tijuana Cross-border Terminal in Otay Mesa will give direct access to Tijuana International Airport, with passengers walking across the U.S.–Mexico border on a footbridge to catch their flight on the Mexican side. 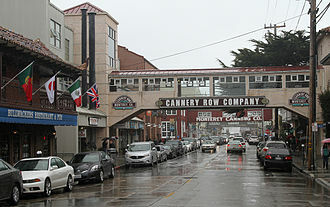 San Francisco, officially the City and County of San Francisco, is the cultural and financial center of Northern California. It is the birthplace of the United Nations, the California Gold Rush of 1849 brought rapid growth, making it the largest city on the West Coast at the time. 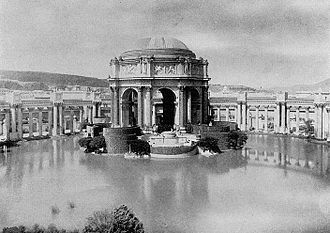 San Francisco became a consolidated city-county in 1856, after three-quarters of the city was destroyed by the 1906 earthquake and fire, San Francisco was quickly rebuilt, hosting the Panama-Pacific International Exposition nine years later. In World War II, San Francisco was a port of embarkation for service members shipping out to the Pacific Theater. Politically, the city votes strongly along liberal Democratic Party lines, San Francisco is the headquarters of five major banking institutions and various other companies such as Levi Strauss & Co. Dolby, Weebly, Pacific Gas and Electric Company, Pinterest, Uber, Mozilla, Wikimedia Foundation, as of 2016, San Francisco is ranked high on world liveability rankings. The earliest archaeological evidence of habitation of the territory of the city of San Francisco dates to 3000 BC. Upon independence from Spain in 1821, the became part of Mexico. Under Mexican rule, the system gradually ended, and its lands became privatized. In 1835, Englishman William Richardson erected the first independent homestead, together with Alcalde Francisco de Haro, he laid out a street plan for the expanded settlement, and the town, named Yerba Buena, began to attract American settlers. 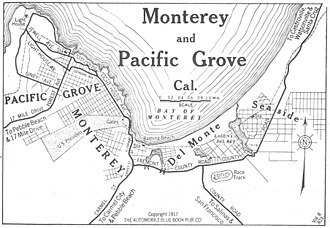 Commodore John D. Sloat claimed California for the United States on July 7,1846, during the Mexican–American War, montgomery arrived to claim Yerba Buena two days later. 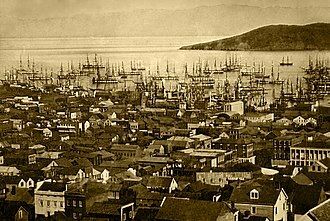 Yerba Buena was renamed San Francisco on January 30 of the next year, despite its attractive location as a port and naval base, San Francisco was still a small settlement with inhospitable geography. The California Gold Rush brought a flood of treasure seekers, with their sourdough bread in tow, prospectors accumulated in San Francisco over rival Benicia, raising the population from 1,000 in 1848 to 25,000 by December 1849. San Jose, officially the City of San José, is the economic and political center of Silicon Valley and the largest city in Northern California. With an estimated 2015 population of 1,026,908, it is the third most populous city in California and the tenth most populous in United States. Located in the center of the Santa Clara Valley, on the shore of San Francisco Bay. San Jose is the county seat of Santa Clara County, the most affluent county in California. 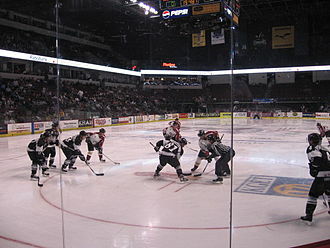 San Jose is the largest city in both the San Francisco Bay Area and the San Jose-San Francisco-Oakland Combined Statistical Area, which contain 7.7 million and 8.7 million people respectively. 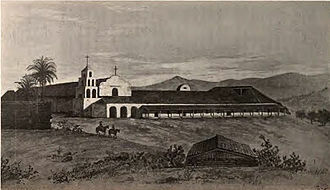 Before the arrival of the Spanish, the area around San Jose was inhabited by the Ohlone people, San Jose was founded on November 29,1777, as the Pueblo of San José de Guadalupe, the first civilian town founded in Spanish Alta California. When California gained statehood in 1850, San Jose became the states first capital, following World War II, San Jose experienced an economic boom, with a rapid population growth and aggressive annexation of nearby cities and communities carried out in the 1950s and 60s. The rapid growth of the high-technology and electronics industries further accelerated the transition from a center to an urbanized metropolitan area. Results of the 1990 U. S. Census indicated that San Jose had officially surpassed San Francisco as the most populous city in Northern California, by the 1990s, San Jose and the rest of Silicon Valley had become the global center for the high tech and internet industries. San Jose is considered to be a city, notable for its affluence. 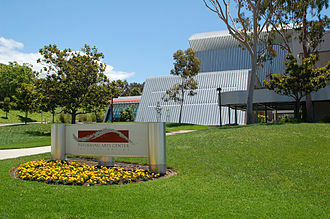 San Joses location within the high tech industry, as a cultural, political. 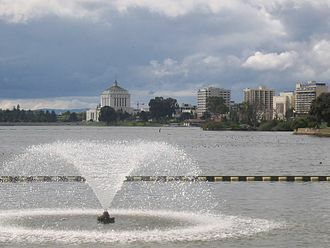 San Jose is one of the wealthiest major cities in the United States and the world, and has the third highest GDP per capita in the world, according to the Brookings Institute. 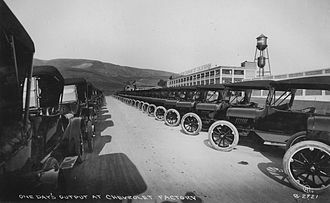 Major global tech companies including Cisco Systems, eBay, Adobe Systems, PayPal, Samsung, Prior to European settlement, the area was inhabited by several groups of Ohlone Native Americans. The first lasting European presence began with a series of Franciscan missions established from 1769 by Junípero Serra, San Jose came under Mexican rule in 1821 after Mexico broke with the Spanish crown. Burbank Bob Hope Airport, branded as Hollywood Burbank Airport is a public airport three miles northwest of downtown Burbank, in Los Angeles County, California. 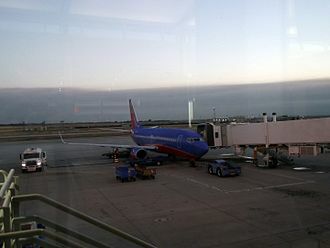 The airport serves the northern Greater Los Angeles area, including Glendale, and it is closer to Griffith Park and Hollywood than Los Angeles International Airport, and is the only airport in the area with a direct rail connection to downtown Los Angeles. Non-stop flights mostly serve cities in the western United States, while JetBlue Airways has a daily flight to New York City. 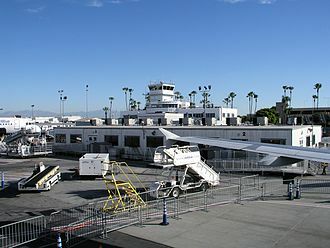 Originally, the airport was located completely within the Burbank city limits, the airport is owned by the Burbank-Glendale-Pasadena Airport Authority, controlled by the governments of those cities. 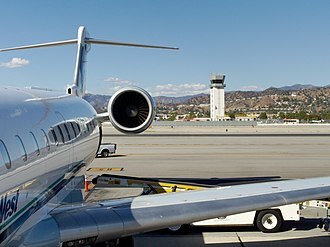 The Airport Authority contracts with TBI Airport Management, Inc. to operate the airport, the airport has its own police department, the Burbank-Glendale-Pasadena Airport Authority Police. Boarding uses portable boarding steps or ramps rather than jet bridges, Federal Aviation Administration records say the airport had 2,647,287 passenger boardings in calendar year 2008,2,294,991 in 2009, and 2,239,804 in 2010. The National Plan of Integrated Airport Systems for 2011–2015 called it a commercial service airport. 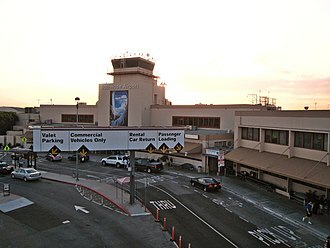 The airport has been named United Airport, Union Air Terminal, Lockheed Air Terminal, Hollywood-Burbank Airport, Burbank-Glendale-Pasadena Airport, Bob Hope Airport, one of these airlines was Pacific Air Transport, which Boeing had acquired because of PATs west coast mail contract in January 1928. BA&T sought a site for a new airport for PAT and found one in Burbank, BA&T had the benefit of surveys that the Aeronautics Department of the Los Angeles Chamber of Commerce had conducted starting in 1926 to identify potential airport sites. It took BA&T a year and the cooperation of the city to assemble the site. The 234-acre site was rife with vines and trees and the ground had to be filled and leveled, but it had good drainage, a firm landing surface, steady winds, construction was completed in just seven months. In an age when few aircraft had brakes and many had a tail skid instead of a wheel, runways were not usually paved, there were no taxi strips, but the designers left room for them. Two of the runways were over 3,600 feet long, generous dimensions, and the site had room for expansion. United Airport was dedicated amid much festivity on Memorial Day weekend,1930, the airport and its handsome Spanish revival terminal was a showy competitor to nearby Grand Central Airport in Glendale, which was Los Angeles main airline terminal. The Burbank facility remained United Airport until 1934 when it was renamed Union Air Terminal, the name change came the same year that Federal anti-trust actions caused United Aircraft and Transport Corp. to dissolve, which took effect September 26,1934. The Union Air Terminal moniker stuck until Lockheed bought the airport in 1940, in March 1939 sixteen airline departures a day were scheduled out of Burbank, eight on United Airlines, five on Western Airlines and three on TWA. Commercial air traffic continued even while Lockheeds extensive factories supplied the war effort and developed numerous military, the April 1957 OAG shows nine weekday departures on Western, six on United, six on Pacific Air Lines, one on TWA and one on American Airlines. Redding, officially the City of Redding, is the county seat of Shasta County, California, in the northern part of the state. It lies along the Sacramento River, which provided transportation and power in its early years, Interstate 5 bisects the entire city, which has a population of 89,861, from the south to north before it approaches Shasta Lake, located about 15 miles north of downtown. Redding is the largest city in the Shasta Cascade region, and it is the fourth-largest city in the Sacramento Valley, behind Sacramento, Elk Grove, the site of Redding was settled by Native Americans of the Wintu tribe around the year 1000. The original county seat was Shasta, located approximately 6 miles west on 299W, Redding became the county seat after the railroad was built. Situated along the Siskiyou Trail, Redding became a stop on a trade and travel route connecting Californias Central Valley, during the early 19th century, Hudsons Bay Company trappers and numerous European-American settlers passed through the site while traveling along the Siskiyou Trail. The first European-American settler in the area was Pierson B and he was an admirer of John Sutter. In 1844, Reading received the Rancho Buena Ventura Mexican land grant for the occupied by todays Redding and Cottonwood, California. At the time it was the northernmost nonnative settlement in California, the railroad routed the tracks through an area known as Poverty Flats, stimulating the development of the European-American town of Redding. The railroad stop was named by the Southern Pacific for railroad man Benjamin B, in 1874 town residents changed the spelling of the name to Reading, to honor local pioneer Pierson B. But the railroad did not officially recognize the change and the town restored its original spelling, Redding was incorporated on October 4,1887 with a population of 600 people. By 1910, Redding had a population of 3,572 supported by a significant mineral extraction industry, with the decline of these industries, which had produced significant amounts of pollution damaging to local agriculture, the population dropped to 2,962 in 1920. By 1930 the population had recovered to 4,188 and boomed during the 1930s with the construction of nearby Shasta Dam, in 1892 brothers John and Charles Ruggles thought that they could make some easy money by robbing a stagecoach. On May 10,1892, the brothers robbed the Weaverville stage, later, on May 12, the brothers stopped the stage again but Charles was hit with buckshot fired by a guard riding inside the coach. On July 24,1892, a lynch mob wearing masks entered the jail, in what became known as the lynching of the Ruggles brothers, the two men were hanged together from a derrick. The city did not grow markedly until the 1950s, stimulated by postwar expansion of the industry to satisfy pent-up demand for new housing across the country. In addition, construction of the Whiskeytown and Keswick dams brought many workers to the area, completion of Interstate 5 in the late 1960s brought a higher level of traffic and added to development. By 1970, Redding had grown to 16,659 people, in the 1970s, Redding annexed the town of Enterprise, located on the eastern bank of the Sacramento River. Long Beach is the 36th most populous city in the United States and the 7th most populous in California. It is located on the Pacific Coast of the United States, as of 2010, its population was 462,257. Long Beach is the second largest city in the Los Angeles metropolitan area, the Port of Long Beach is the second busiest container port in the United States and is among the worlds largest shipping ports. The city maintains a progressively declining oil industry with minor wells located both directly beneath the city as well as offshore, manufacturing sectors include those in aircraft, automotive parts, electronic equipment, audiovisual equipment, precision metals and home furnishings. Long Beach lies in the corner of Los Angeles County. 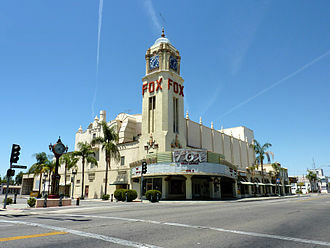 Downtown Long Beach is approximately 22 miles south of Downtown Los Angeles, indigenous people have lived in coastal Southern California for over 10,000 years, and several successive cultures have inhabited the present-day area of Long Beach. By the 16th-century arrival of Spanish explorers, the dominant group were the Tongva people and they had at least three major settlements within the present-day city. Tevaaxaanga was a settlement near the Los Angeles River, while Ahwaanga and Povuunga were coastal villages. Along with other Tongva villages, they were forced to relocate in the century due to missionization, political change. In 1784 the Spanish Empires King Carlos III granted Rancho Los Nietos to Spanish soldier Manuel Nieto, the Rancho Los Cerritos and Rancho Los Alamitos were divided from this territory. The boundary between the two ran through the center of Signal Hill on a southwest to northeast diagonal. A portion of western Long Beach was originally part of the Rancho San Pedro and its boundaries were in dispute for years, due to flooding changing the Los Angeles River boundary, between the ranchos of Juan Jose Dominguez and Manuel Nieto. In 1843 Jonathan Temple bought Rancho Los Cerritos, having arrived in California in 1827 from New England and he built what is now known as the Los Cerritos Ranch House, a still-standing adobe which is a National Historic Landmark. Temple created a cattle ranch and prospered, becoming the wealthiest man in Los Angeles County. Oakland International Airport is an international airport in Oakland, United States. It is located approximately 10 miles south of Downtown and it is owned by the Port of Oakland. The airport has service to cities in the United States, Mexico. Cargo flights fly to cities in the United States, Oakland is a focus city for Southwest Airlines and Allegiant Air. As of August 2015 Southwest has 120 daily departures on peak-travel days of the week, Alaska Airlines combined with sister-carrier Horizon Air has been the second-busiest carrier at the airport through 2013. In January 2014, Delta overtook Alaska as the airports No.2 carrier, the top five airlines by passenger count between October 2014 – September 2015 were Southwest Airlines, Alaska Airlines, Spirit Airlines, Hawaiian Airlines, JetBlue Airways. Between October 2014 and September 2015,10,947,066 people traveled through OAK, in 2009, OAK had the highest on-time arrival percentage among the 40 busiest North American airports. The city of Oakland looked into the construction of an airport starting in 1925, in 1927 the announcement of the Dole prize for a flight from California to Hawaii provided the incentive to purchase 680 acres in April 1927 for the airport. The 7, 020-foot-long runway was the longest in the world at the time, the airport was dedicated by Charles Lindbergh September 17. Earhart departed from this airport when she made her final, ill-fated voyage, Boeing Air Transport began scheduled flights to Oakland in December 1927. It was joined by Trans World Airlines in 1932, in 1929, Boeing opened the Boeing School of Aeronautics on the field, which expanded rapidly in 1939 as part of the Civilian Pilot Training Program. Thousands of pilots and mechanics were trained before the facility was changed into the United Air Lines training center in 1945, armed Forces temporarily took over Oakland Airport and opened Naval Air Station Oakland. It was transformed into a base for military flights to the Pacific islands. After the war, airlines slowly returned to Oakland, Western Airlines began flights in 1946, and was followed by American Airlines, TWA, Transocean Airlines and Pacific Southwest Airlines. 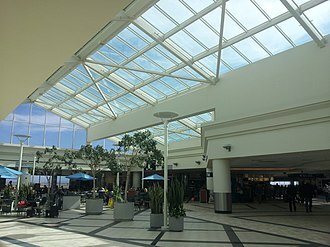 The airports first Jet Age airline terminal was designed by John Carl Warnecke & Associates and opened in 1962, part of a $20 million expansion on bay fill that included the 10, 000-foot runway 11/29. 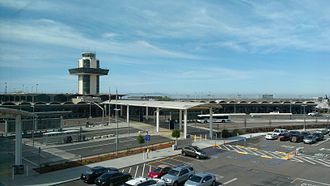 San Francisco International Airport is an international airport 13 miles south of downtown San Francisco, United States, near Millbrae and San Bruno in unincorporated San Mateo County. It has flights to points throughout North America and is a gateway to Europe. 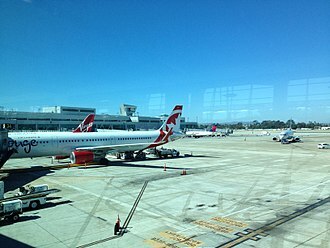 SFO is the largest airport in Northern California and the second busiest in California, in 2014, it was the seventh busiest in the United States and the twenty-first busiest airport in the world by passenger count. It is the fifth largest hub for United Airlines and functions as United Airliness primary transpacific gateway and it serves as Virgin Americas principal base of operations. It is the sole hub of United Airlines, and houses the Louis A. Turpen Aviation Museum. 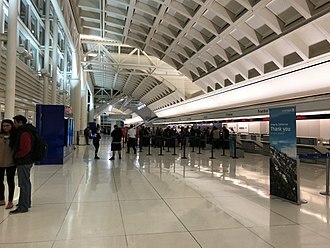 SFO is owned and policed by the City and County of San Francisco, between 1999 and 2004 the San Francisco Airport Commission operated city-owned SFO Enterprises, Inc. to oversee its business purchases and operations of ventures. San Francisco held a ceremony for Mills Field Municipal Airport on May 7,1927 on 150 acres of cow pasture. The land was leased from Ogden L. Mills who had leased it from his grandfather Darius O. Mills, San Francisco International Airport was named Mills Field Municipal Airport until 1931, when it became San Francisco Municipal Airport. Municipal was replaced by International in 1955, United Airlines served SFO and Oakland Municipal Airport beginning in the 1930s. The March 1939 Official Aviation Guide shows 18 airline departures on weekdays— seventeen United flights, the aerial view c.1940 looks west along the runway that is now 28R, the seaplane harbor at right is still recognizable north of the airport. Earlier aerial looking NW1943 vertical aerial The August 1952 chart shows runway 1L7000 feet long, 1R7750 feet, 28L6500 feet and 28R8870 feet. Competition with United led Pacific Seaboard to move all of its operations to the eastern U. S. and rename itself Chicago and it became a large domestic and international air carrier. Chicago & Southern was acquired by and merged into Delta Air Lines in 1953 thus providing Delta with its first international routes, United Airlines Douglas DC-6 propliners flying to and from Hawaii used the Pan American World Airways terminal beginning in 1947. Mammoth Lakes is a town in Mono County, the countys only incorporated community. It is located 9 miles northwest of Mount Morrison, at an elevation of 7,880 feet, as of the 2010 United States Census, the population was 8,234, reflecting an increase of 1,141 from the 7,093 counted in the 2000 Census. The first people to inhabit the vicinity of Mammoth Lakes was the Mono people, evidence declares that they have been living in the area for thousands of years. They settled in the valley but walked to other places when trading with different tribes, the European history of Mammoth Lakes started in 1877, when four prospectors staked a claim on Mineral Hill, south of the current town, along Old Mammoth Road. In 1878, the Mammoth Mining Company was organized to mine Mineral Hill, by the end of 1878,1500 people settled in the mining camp called Mammoth City. By 1880, the company had shut down, and by 1888, by the early 1900s, the town of Mammoth was informally established near Mammoth Creek. 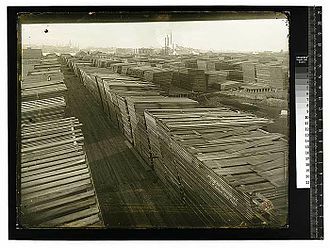 The economics of the town was based on logging and tourism. The first post office at Mammoth Lakes opened in 1923, in 2004, the Mammoth Ski Museum opened in town. The museum featured many artifacts and posters. A movie documenting the life of the founder of the ski resort, in 2010, photographs taken by Dave McCoy were featured in an exhibit at the museum. In 2008, after a trial, the Mono County Superior Court entered a $43 million judgment against the Town of Mammoth Lakes for breach of a development agreement. The California Court of Appeal, Third District, affirmed the judgment in December 2010, on Monday July 2,2012, Mammoth Lakes filed for bankruptcy in the face of the judgement. Later the same year, the bankruptcy was dismissed as a result of a settlement between the town and their largest creditor. According to the United States Census Bureau, the town has an area of 25.3 square miles, of which 24.9 sq mi are land. Mammoth Lakes lies on the edge of the Long Valley Caldera, the area around the town is geologically active, with hot springs and rhyolite domes that are less than 1000 years old. Meadows Field is a public airport in Kern County, three miles northwest of Downtown Bakersfield, California. 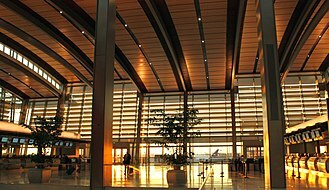 It is the airport for the Bakersfield area, and one of two international airports in the San Joaquin Valley. 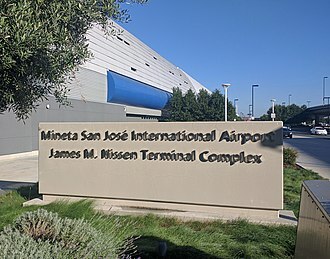 Also known as Kern County Airport #1, it is in Oildale, federal Aviation Administration records show 141,847 passenger boardings in calendar year 2008,103,067 in 2009 and 111,699 in 2010. The National Plan of Integrated Airport Systems for 2011–2015 categorized it as a commercial service airport. Aviation has been linked to Kern County almost as long as the existence of the industry, in 1891 Charles Howard ascended in a hot air balloon to 1,000 feet. He proceeded to jump and landed safely with a parachute he designed and constructed, by 1910, only seven years after the Wright Brothers first airplane flight, aircraft began arriving in the county. They were brought in by Glenn Curtiss, the first flight in the area was flown by Charles Hamilton. The more prominent field was at Sacramento and Monterey streets in East Bakersfield and it was named Bernard Field and was run by the Pacific Aero Club. The field would be a stop for US Air Mail from 1923 to 1926, another airfield was on the Panorama Bluffs in Northeast Bakersfield where Greenlawn Mortuary is today. With the development of air service Bakersfield needed a purpose-built commercial airport. In 1926 the Kern County Chamber of Commerce constructed and operated a new airport called Kern County Airport No.1, originally at the intersection of U. S. Route 99 and Norris Road, the following year it was moved one mile east to its current location. The original facility had one runway, one building. In 1935 Kern County bought the airport from the Chamber of Commerce and it was the first county-owned airport in the nation. 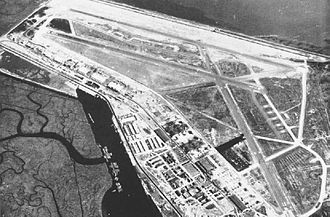 In September 1939 war broke out in Europe, prompting Congress to appropriate $40 million for Development of Landing Areas for National Defense, under DLAND, the secretaries of War and the Navy approved expenditures for airports. By 1941 the Army Air Corps had begun directing aid to Meadows Field for improvements to include operation of airport towers, in late 1943 the United States Army Air Forces acquired usage rights to Meadows Field. Ontario is a city located in southwestern San Bernardino County, United States,35 miles east of downtown Los Angeles. 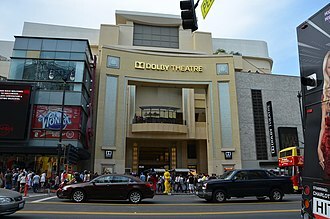 Located in the part of the Inland Empire region, it lies just east of the Los Angeles county line and is part of the Greater Los Angeles Area. As of the 2010 Census, the city had a population of 163,924, up from 158,007 at the 2000 census, making it the fourth most populous city after San Bernardino, Fontana. The city is home to the Ontario International Airport, which is the 15th busiest airport in the United States by cargo carried, Ontario handles the mass of freight traffic between the ports of Los Angeles and Long Beach and the rest of the country. It is the home of Ontario Mills and former home of the Ontario Motor Speedway and it takes its name from the Ontario Model Colony development established in 1882 by the Canadian engineer George Chaffey and his brothers William Chaffey and Charles Chaffey. They named the settlement after their province of Ontario. At the time of Mexican and of American settlement, active Native American settlements were scattered across the entire valley, remains of a Serrano village were discovered in the neighboring foothills of the present-day city of Claremont. Following the 1819 establishment of San Bernardino Asistencia, which may have served as an outpost of the San Gabriel mission, it part of a large. In 1826, Jedediah Smith passed through what is now Upland on the first overland journey to the West coast of North America via the National Old Trails Road, the 1834 secularization of California land holdings resulted in the lands transferral to private hands. In 1881, the Chaffey brothers and William, purchased the land and they created the main thoroughfare of Euclid Avenue, with its distinctive wide lanes and grassy median. The new Model Colony was originally conceived as a dry town, the two named the town Ontario in honor of the province of Ontario in Canada, where they were born. 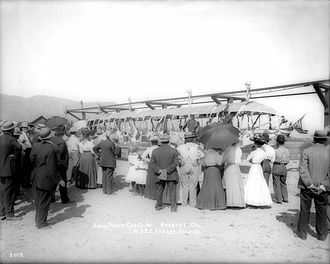 Ontario attracted farmers and ailing Easterners seeking a drier climate, to impress visitors and potential settlers with the abundance of water in Ontario, a fountain was placed at the Southern Pacific railway station. It was turned on when trains were approaching and frugally turned off again after their departure. California is the most populous state in the United States and the third most extensive by area. Located on the western coast of the U. S, California is bordered by the other U. S. states of Oregon and Arizona and shares an international border with the Mexican state of Baja California. Los Angeles is Californias most populous city, and the second largest after New York City. 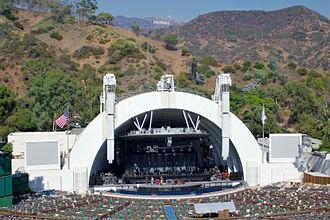 The Los Angeles Area and the San Francisco Bay Area are the nations second- and fifth-most populous urban regions, California has the nations most populous county, Los Angeles County, and its largest county by area, San Bernardino County. The Central Valley, an agricultural area, dominates the states center. What is now California was first settled by various Native American tribes before being explored by a number of European expeditions during the 16th and 17th centuries, the Spanish Empire claimed it as part of Alta California in their New Spain colony. The area became a part of Mexico in 1821 following its war for independence. The western portion of Alta California was organized as the State of California, the California Gold Rush starting in 1848 led to dramatic social and demographic changes, with large-scale emigration from the east and abroad with an accompanying economic boom. If it were a country, California would be the 6th largest economy in the world, fifty-eight percent of the states economy is centered on finance, real estate services and professional, scientific and technical business services. Although it accounts for only 1.5 percent of the states economy, the story of Calafia is recorded in a 1510 work The Adventures of Esplandián, written as a sequel to Amadis de Gaula by Spanish adventure writer Garci Rodríguez de Montalvo. The kingdom of Queen Calafia, according to Montalvo, was said to be a land inhabited by griffins and other strange beasts. This conventional wisdom that California was an island, with maps drawn to reflect this belief, shortened forms of the states name include CA, Cal. Calif. and US-CA. 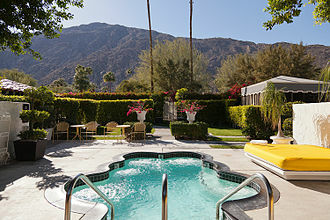 Palm Springs is a desert resort city in Riverside County, United States, within the Coachella Valley. It is located approximately 55 mi east of San Bernardino,107 mi east of Los Angeles,123 mi northeast of San Diego, the population was 44,552 as of the 2010 census. Palm Springs covers approximately 94 square miles, making it the largest city in the county by land area, golf, horseback riding and tennis in the nearby desert and mountain areas are major forms of recreation in Palm Springs. The city is famous for its mid-century modern architecture and design elements. Archaeological research has shown that the Cahuilla people have lived in the area for the past 350–500 years, the Cahuilla name for the area was Se-Khi. The alternating non-reservation sections were granted to the Southern Pacific Railroad as an incentive to bring rail lines through the open desert, presently the Agua Caliente Band of Cahuilla Indians is composed of several smaller bands who live in the modern day Coachella Valley and San Gorgonio Pass areas. The Agua Caliente Reservation occupies 32,000 acres, of which 6,700 acres lie within the city limits, as of 1821 Mexico was independent of Spain and in March 1823 the Mexican Monarchy ended. With the Treaty of Guadalupe Hidalgo, the region was ceded to the United States in 1848, one possible origin of palm in the place name comes from early Spanish explorers who referred to the area as La Palma de la Mano de Dios or The Palm of Gods hand. The earliest use of the name Palm Springs is from United States Topographical Engineers who used the term in 1853 maps, other early names were Palmetto Spring and Big Palm Springs. 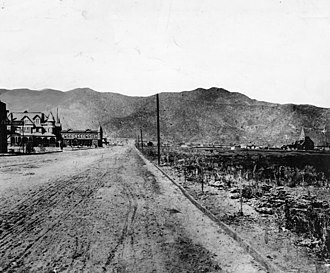 The first European resident in Palm Springs itself was Jack Summers, fourteen years later, the Southern Pacific railroad was laid 6 miles to the north, isolating the station. By 1885, when San Francisco attorney John Guthrie McCallum began buying property in Palm Springs, the area was named Palm Valley when McCallum incorporated the Palm Valley Land and Water Company with partners O. C.
Mission San Diego de Alcalá drawn as it was in 1848. Established in 1769, it was the first of the California Missions. The Pythian Castle building in Arcata is on the National Register of Historic Places. The Jacoby Building, commonly known as Jacoby's Storehouse, on the Plaza in Arcata, is one of Humboldt County's oldest commercial buildings (the first floor dates from 1857), and is also on the National Register of Historic Places. The First Baptist Church building, which survived the 1952 earthquake and is now a commercial-use structure, is one of several buildings in Bakersfield listed on the National Register of Historic Places. 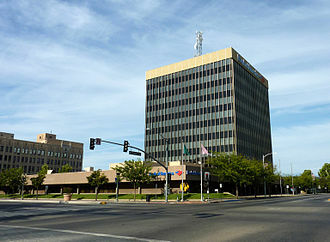 Truxtun Tower, also referred to as the Bank of America Building, is the tallest in downtown and the second-tallest building in Bakersfield. 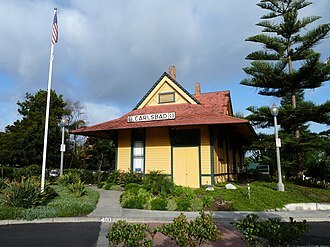 The Old Santa Fe Depot, built in 1907, is a local landmark listed on the National Register of Historic Places and currently houses the city's Visitor's Information Center. The Senator Theater, completed in 1928 for $300,000, was designed by Timothy L. Pflueger for Michael Naify and the Nasser Brothers. Brother Jonathan Cemetery in Crescent City. Alaska Airlines Embraer 175 operated by SkyWest Airlines parked at the gate at Fresno Yosemite International Airport. 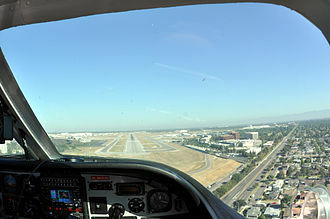 SkyWest is a major operator from Fresno with a maintenance facility and aircrew base located at the airport. 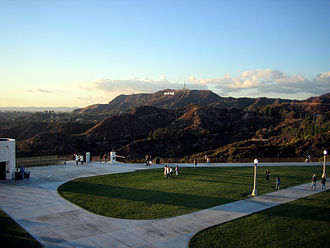 A very clear evening view of Mount Lee and the Hollywood Sign from the Griffith Observatory lawn, one day after a rain. Hangar No. 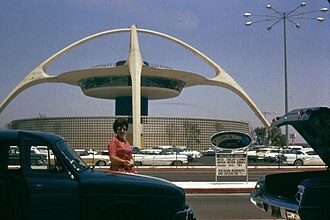 1 was the first structure at LAX, built in 1929, restored in 1990 and remaining in active use. 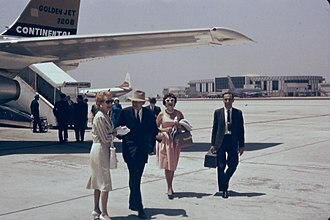 Continental passengers arriving at CAL terminal, July 1962, before jet-ways were constructed. "Welcome to Mammoth Lakes, California"
Construction on the Custom House began in 1814 under Spanish rule. This photo dates from 1936. In 1924, the Tribune Tower was completed; in 1976, it was restored and declared an Oakland landmark. It is no longer used by the Oakland Tribune. 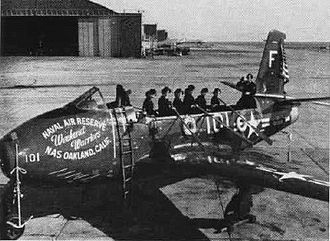 Advertising the Naval Air Reserve at NAS Oakland, 1949. The olive vat room at Graber Olive House in Ontario, California. In 1894, two years after planting olive trees in Ontario, C. C. Graber began selling vat cured olives from the pictured vat room in vats similar to the ones pictured. Graber Olive House is the oldest operating olive packer in the United States. 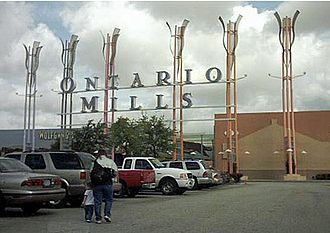 Ontario Mills in March 2005. Check-in counters at Terminal 2. Main corridor of Terminal 2. Terminal 2 of the airport. The San Jacinto Mountains border Palm Springs to the west. A 1960s postcard of Palm Springs with Mt. San Jacinto in the background. Terminal expansion in progress in June, 2013. 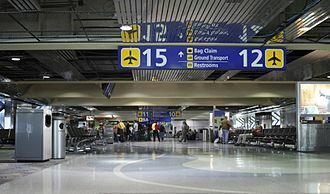 The temporary baggage claim can be seen at right. Sutter's Fort was founded in 1840 by John Augustus Sutter during the period of Mexican California. Sacramento in 1849, when the city was an economic center of the California Gold Rush. Tower Bridge, which connects Sacramento to West Sacramento, was built in 1935 and is a California Historical Landmark. 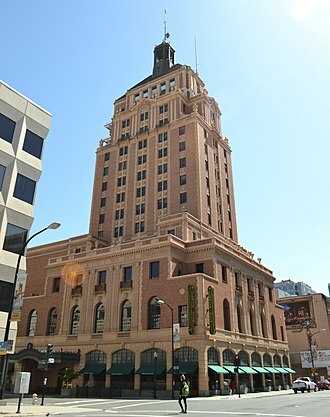 The Elks Tower was built in 1926 in an Italianate style. Lower floor of the new Terminal B.
Kumeyaay people lived in San Diego before Europeans settled there. Namesake of Horton Plaza, Alonzo Horton developed "New Town" which became Downtown San Diego. Spirit of St. Louis replica inside the airport. 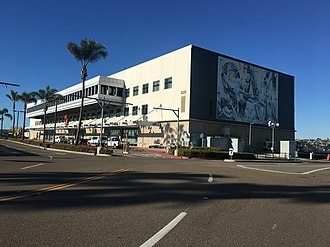 San Diego International Airport's former Commuter Terminal houses administrative offices for the San Diego County Regional Airport Authority. 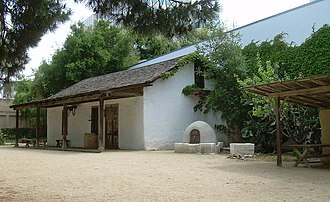 The Luis María Peralta Adobe in San Pedro Square (built 1797) is San Jose's oldest building. 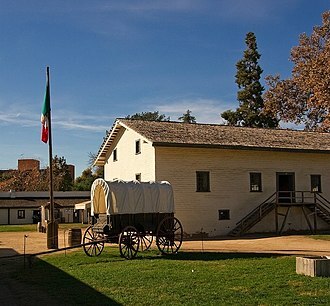 San Jose celebrates the anniversary of its foundation every year at the Peralta Adobe. Monument to Thomas Fallon, 10th Mayor of San Jose. San Jose Must Have An Airport – 1929.